This comparison shows the difference in how tea bushes are grown and plucked depending on desired end product. 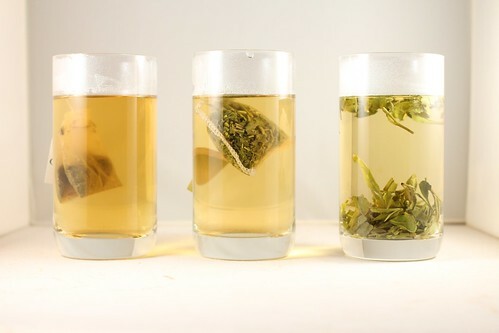 Left: “two leaves and a bud” make up the majority of good quality loose leaf teas from all origins. The bud and leaves are of similar size. Younger, smaller leaves will keep a greater range of flavor and aroma when processed. Right: Leaves below the bud are allowed to grow larger so as to yield a larger quantity for CTC (crush, tear, curl) and “dust” grades of tea for teabags. Larger, older leaves, loose the fine flavors and aromas yet provide that deep, dark, black of black tea that is so often desired. Images from my visit to Highfield Tea Estate, in Coonoor, Tamil Nadu, India. May 2013. Left: Twinings Camomile dust in a bag. Dark yellow and cloudy. Brew smells of plastic. 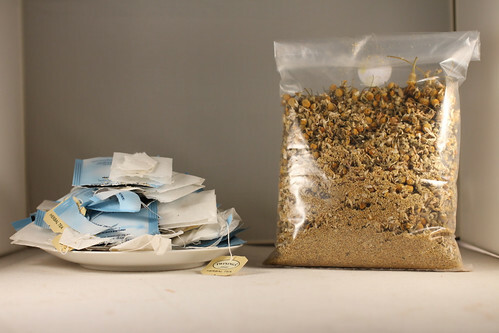 Right: Loose Chamomile in a blank tea bag. Authentic flavor, aroma and clear in color. Yes. Most tea bags are filled with very finely ground particles of low quality tea, most of which is the end result from the production and handling of tea leaves. The dust from a Lipton tea bag (center) sits next to real Chinese green tea leaves. A tea bag made of paper sits in a foil or plastic pouch. Twenty of these sit in a box, sometimes wrapped in plastic again. It ends up being a very small about of tea dust and a huge amount of trash. The pile of trash generated from 20 bags of Chamomile dust versus the amount of loose Chamomile you could buy for the same price. The taste from tea bags poorly represents the true flavors and nuances you’d get in loose leaf tea. This is like eating the lowest quality of chocolate (tastes and feels like plastic). For many there is no comparison since loose leaf tea is not part of their routine. Another factor is how tea bags are packaged. A tea bag typically lives in a sealed foil or plastic pouch, stuffed into a cardboard box and sometimes wrapped in plastic again. The marketing speak indicates this preserves flavor, but there’s no real flavor to preserve from tea dust. All this packaging adds to the lame smell of tea bags. 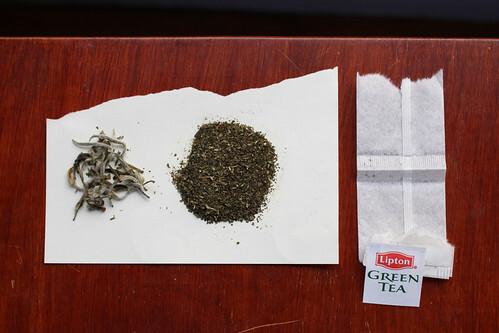 Left to right: Lipton green tea bag, Mighty Leaf tea bag, loose leaf. But buying loose leaf tea is overwhelming and expensive! Packaging waste comparison on Flickr. Left: the amount of waste generated from 20 Twinings Chamomile tea bags and wrappers. Cost is $3.99. Right: The amount of Chamomile you can buy for $3.99 at Rainbow Grocery in San Francisco. You can make well over 20 cups with this. Waste: the reusable plastic bag. Right: The amount of Chamomile you can buy for $3.99 at Rainbow Grocery in San Francisco.